LIMBANG: Four administration offices of SMK Medamit were destroyed by a fire that started at around 12.10am this morning (Nov 9). The Limbang Fire and Rescue Department (Bomba) chief Tawang Lingem said no one was injured but several of the schools documents and equipment were destroyed after fire razed the four offices on the first floor of the school administrative building. The fire outbreak was first spotted by security guards who initially tried to douse the fire using two fire extinguishers but were not successful as the fire had spread rapidly. No one was injured in the fire which destroyed 50 percent of the staff room . We were informed of the fire outbreak at 12.28 midnight and Bomba personnel used water from both the open source and from our water tender to put out the fire. “The fire was completely extinguished at 5.16am, said Tawang this morning. 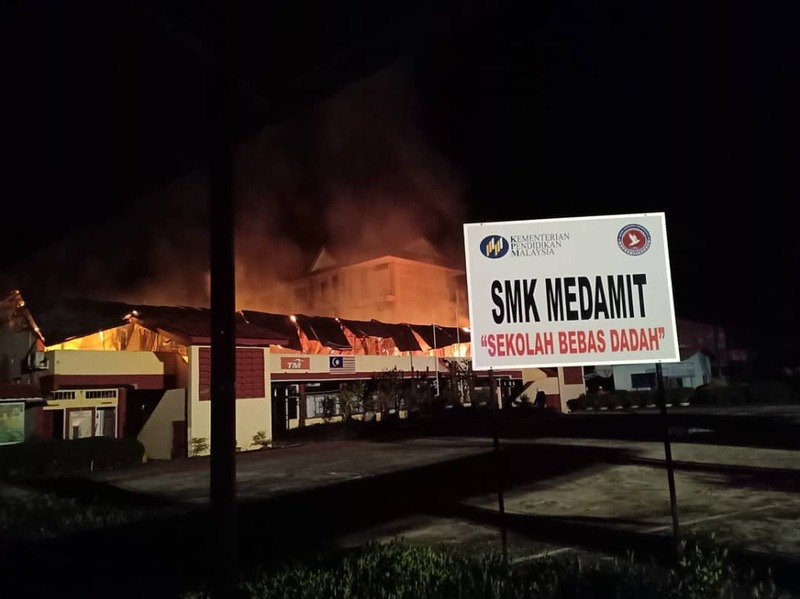 Meanwhile Limbang District Police Chief, Superintendent Mohd Bukhori Saffai said initial investigations showed that the fire was believed have started from an electrical short-circuit in the school’s counselling office which then spread quickly to the other surrounding offices.